Disgraced Chinese politician Bo Xilai, seen in court Thursday, denied some of the corruption charges he faces and asked that he be judged "reasonably." 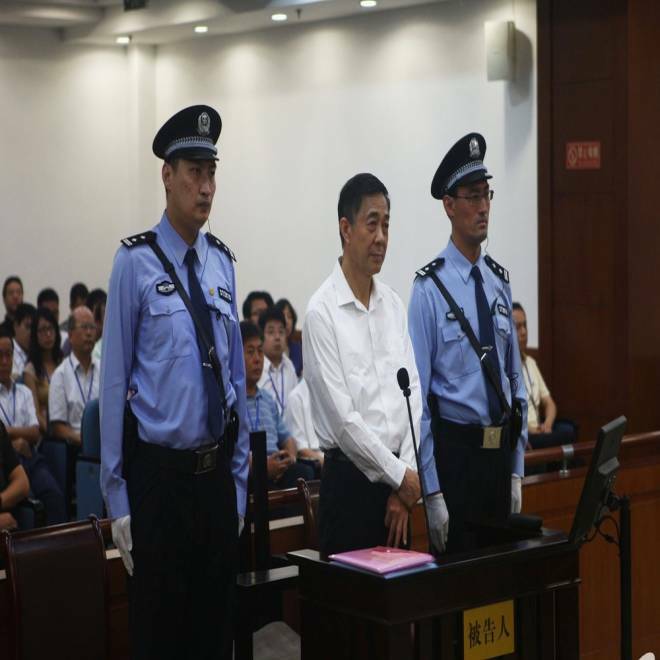 JINAN, China – The wife of a disgraced Chinese politician turned on him during his corruption trial Thursday, saying he filled the family safes with cash and admitting she spent huge amounts. Bo Xilai, once tipped as a possible Chinese president, dismissed the testimony of his wife Gu Kailai as “laughable,” “ridiculous” and “legally invalid,” suggesting she had a history of mental illness. Gu was jailed last year for murdering a British businessman. Foreign journalists have not been allowed in the court, but officials posted regular updates on the proceedings on the China’s Twitter-like microblog Sina Weibo. It was unclear how comprehensive the reports were. Bo is accused of corruptly netting a total of almost 27 million yuan (about $4.4 million) in one of the country’s biggest political scandals in decades. 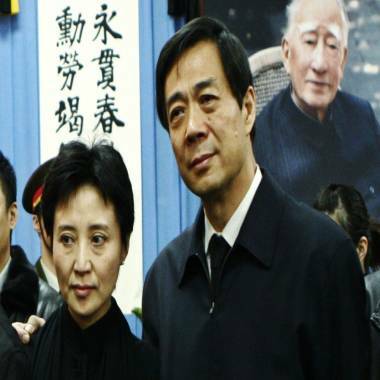 Bo Xilai and his wife Gu Kailai in 2007. Contrary to earlier expectations that the government would choreograph the trial to ensure a verdict that would help effort to bury his legacy, Bo contested some of the government charges. Bo is still seen by many as a champion of the little guy and a victim of power struggle. He is charged with receiving about 21.8 million yuan ($3.56 million) in bribes from Xu Ming, a plastics-to-property entrepreneur who is a close friend and is in custody, and Tang Xiaolin, the general manager of Hong Kong-based export company Dalian International Development Ltd, the court said. Bo called Tang “a mad dog” who wanted to “frame me out of consideration for his own interests,” according to the officials. “I did not do it [referring to one specific charge involving a business project in southern China] for personal interests, if it were for personal interests, I would not have agreed to it,” he added. The unexpectedly defiant defense by Bo -- despite his reported confessions – caused a stir among analysts and legal experts. “It is possible that this new development will complicate the government's efforts to control the outcome of the trial," said attorney Mou Shaoping, a veteran of several high-profile cases. China's most politically explosive trial wrapped in a matter of hours when Gu Kailai, the wife of Chinese politician Bo Xilai, did not object to murder charges against her. ITV's Angus Walker reports. The trial went ahead Thursday amid massive security with hundreds of police officers cordoning off the courthouse from ordinary citizens. Despite the tight security, supporters of Bo managed to unfurl a red banner and make their opposition to the trial known to foreign media outside. Several protesters were seen being taken away by the police. Bo could face a death sentence for his charges, though a suspended death sentence is more likely, which effectively means life imprisonment, or a 20-year term. His guilt is an almost foregone conclusion given that prosecutors and courts come under Communist Party control.